Alison Alderton visits one of Ireland’s most famous monastic sites. ARRIVAL at a destination by boat is always special but there is one place in Ireland where, in my opinion, it cannot be bettered. 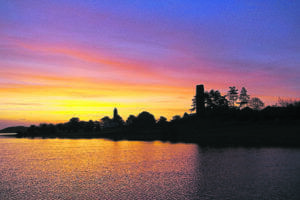 After threading your way through the rich tapestry of grasslands known as the callows for nine miles south of Athlone, the landscape surrounding the River Shannon changes dramatically. Erupting into a range of steep, grassy mounds, known as esker ridges, these impressive hills were formed in the last ice age when retreating ice sheets deposited gravel and boulders. Over time the surrounding soft land was worn away leaving these deposits high and dry. Now clothed in grass and wild flowers, they compete for attention with the tall, slender, round towers, richly engraved high crosses and crumbling ruined churches of Ireland’s most famous monastic site – Clonmacnoise. Boats can be moored on the free public pontoons situated beneath the stunning ruins of the Norman castle, which projects the dramatic appearance of toppling precariously to one side of its steep embankment. It is worth making the short, steep climb to the summit and drinking in the fine views of the open, windswept countryside. On first impressions, Clonmacnoise may seem to have been created on a rather lonely and isolated site but at one time this was an important crossroads on Ireland’s main east-west road, known as the Esker Way, and the natural water highway of the River Shannon. 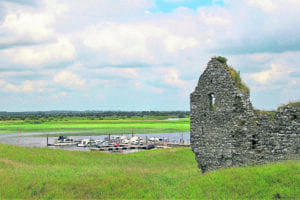 St Ciarán founded Clonmacnoise in the mid-sixth century. The first structures would have been wooden, however, in the ninth century these began to be replaced with stone. By the 11th century a large secular community of between 1500 to 2000 people lived and worked on or around the site; they comprised metalworkers, craftsmen and farmers who supported the monastic clergy and their students. Clonmacnoise became a great centre of learning and a university for Western Europe during the period known as The Dark Ages. Several historical manuscripts were written here, including the Annals of Tighernach and the Book of the Dun Cow, and it became the burial place of the High Kings of Tara. By the 12th century Clonmacnoise began to decline. Primarily due to the growth of Athlone to the north, which became the main trading town for the midlands of Ireland, the most popular route for crossing the Shannon, and the best-defended settlement in the region. People migrated north from Clonmacnoise, and with the fall in population went much of the support that the site needed to survive. Burned and pillaged, firstly in tribal feuds by the Irish themselves, then later by the Danes, Normans and English, it was constantly being rebuilt by the men of God who inhabited it until finally in 1552, the Tudor-English garrison of Athlone destroyed it completely. Today the site is preserved for all to enjoy as one of Ireland’s major tourist attractions. Included within its boundary are the ruins of a cathedral, seven churches, two round towers, three high crosses and a large collection of early Christian grave slabs. At the informative visitor centre it is possible to watch an audio-visual presentation about the creation of Clonmacnoise, discover many archaeological artefacts and marvel at the richly engraved high crosses, which have been re-sited undercover to protect them from the harsh outdoor environment. The most impressive of these is the 4m (13ft) high, sandstone, Cross of the Scriptures. In their original locations, reproductions have been erected maintaining the famous outline of the Clonmacnoise site. Ireland is famed for its round towers and there are two at Clonmacnoise. O’Rourke’s Tower measuring 19.3m (63ft) in height is missing its conical cap which was destroyed by lightening in 1135 but the smaller and better-preserved McCarthy’s Tower retains its cap. There are conflicting beliefs on why round towers were constructed. These range from use as lookouts during times of raiding, to a safe place where church artefacts could be stored, and use as a belfry to call the congregation to prayer. 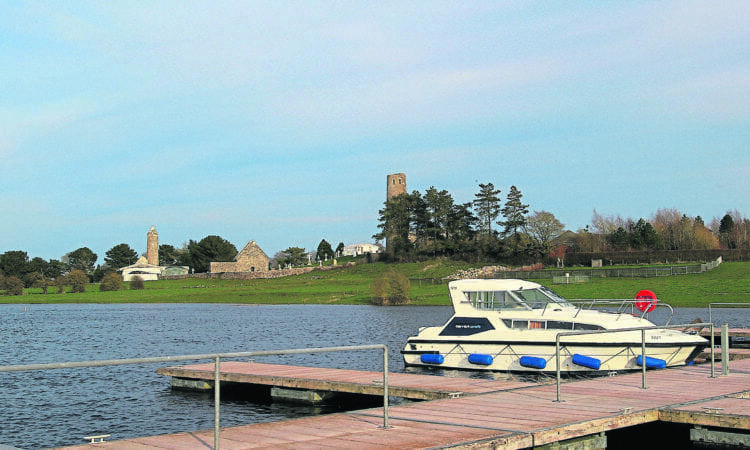 Boaters opting to stay the night at this special place on the Shannon will reap the best rewards, as once the day trippers have dispersed, all is silent at Clonmacnoise. The setting sun bathes the grey stone ruins in golden light before silhouetting the round towers against the darkening sky and, on cloudless nights, the stars seem to shine more brightly here – it is the perfect place to contemplate all creation. Next time we will take a closer look at the impact the Vikings had on Ireland and trace the journey of a very special long ship. 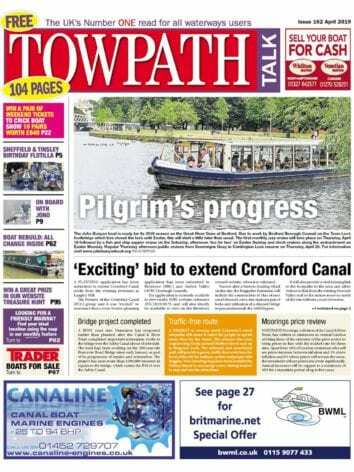 Next Post:How towpath times have changed!